Diet Information for Teens, 4th Ed. In the swirl of misleading and confusing nutrition information found in television advertisements and on the internet, it can be difficult for a teen to know what constitutes a proper diet. Rising rates of some health conditions, like diabetes and obesity, make it especially important that teens become educated about their dietary choices because what a teenager chooses to eat can have implications that last a lifetime. 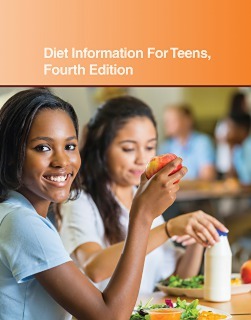 Diet Information For Teens, Fourth Edition provides updated information about healthy eating patterns and making smart dietary choices, including facts from the recently released Dietary Guidelines for Americans and the MyPlate food guidance system. The book discusses the essential components of a well-constructed diet and explains how major food groups— such as grains, vegetables, fruits, and protein foods—play an important role in providing the vitamins and minerals needed to maintain good health. Dietary elements that may need to be limited, such as caffeine, sugar, fat, and salt, are also discussed along with tips for reducing screen time, staying active, and addressing weight-related concerns. A special section on eating and disease provides information about foodborne illness, eating disorders, and disorders where dietary choices are an essential part of disease management procedures. The book concludes with cooking tips and directories of resources for dietary and fitness information. This book is divided into parts and chapters. Parts focus on broad areas of interest and chapters are devoted to single topics within a part. Part One: Nutrition Fundamentals looks at the most recently released Dietary Guidelines for Americans and explains dietary components. It discusses calorie requirements and energy balance, andit explains how nutrition facts labels can be used to help compare the nutrient contents of food items. Details about the individual food groups that comprise a healthy diet, including grains, vegetables, fruits, dairy, and proteins are also included. Part Two: Vitamins And Minerals offers individual chapters focusing on the major vitamins—A,B, C, D, and E—and calcium, a mineral of special concern to growing teens. Each chapter discusses the role the nutrient plays in maintaining good health and gives examples of foods that are rich sources of the nutrient. Additional chapters provide facts about other important minerals and dietary supplements. Part Three: Other Elements Inside Food discusses components of foods that are sometimes consumed in excess or that may be monitored carefully for specific purposes. These include salt, carbohydrates, sugars, and fats. Information about food additives and artificial sweeteners is also included. Part Four: Smart Eating Plans introduces the MyPlate food guidance system and discusses ways to develop eating patterns that support a healthy lifestyle. It also offers suggestions for making healthy food choices in a variety of settings, including eating out, eating in the school cafeteria, and snacking. Facts about caffeine, energy drinks, and sports supplements are presented, and the part concludes with information on healthy eating for vegetarians and vegans. Part Five: Eating And Weight-Related Concerns addresses readers who want to identify and maintain a healthy weight. It describes the body mass index (BMI), discusses body image concerns, and provides suggestions for people seeking to achieve weight-related goals. Facts about how physical activity contributes to the success of weight management—and how spending too much time in front of a screen (television, computer, etc.) can disrupt efforts—are also included. Part Six: Eating And Disease explains the link between dietary elements and some specific health conditions, such as heart health and obesity, where food choices may either contribute to, or help prevent diseases. It describes situations where careful adherence to a meal plan is an integral part of disease management strategies, such as avoiding gluten in celiac disease, managing blood sugar in diabetes, and avoiding triggers when food allergies or intolerances are present. The part concludes with information about foodborne illness and eating disorders. Part Seven: If You Need More Information offers a chapter on cooking tips and suggested resources for finding healthy recipes and planning meals. Directories of dietary and fitness resources are also included.